That hulking 1930's 138th Division of the Missouri National Guard building "The Armory" just north of I-64 in the Midtown Neighborhood is seeing new development. This project has been in the works for awhile and certainly predates 2017, but I have to be honest, I wasn't confident this one would come to fruition. The isolation of the location seemed to make this one seem like a long shot. If you are interested in this strange part of St. Louis check out photos HERE. But, this is a beautiful building that I am glad has not succumbed to the elements/vandals since it's been shuttered for ten years. Another thing that tipped the scales toward including this project in our 2017 favorites list is the maturing of Chouteau Greenway, the Great Rivers Greenway protected bike/pedestrian trail that would go right around the Armory. This could just the thing that could connect some difficult areas of the city. So what exactly is the plan for this massive building? 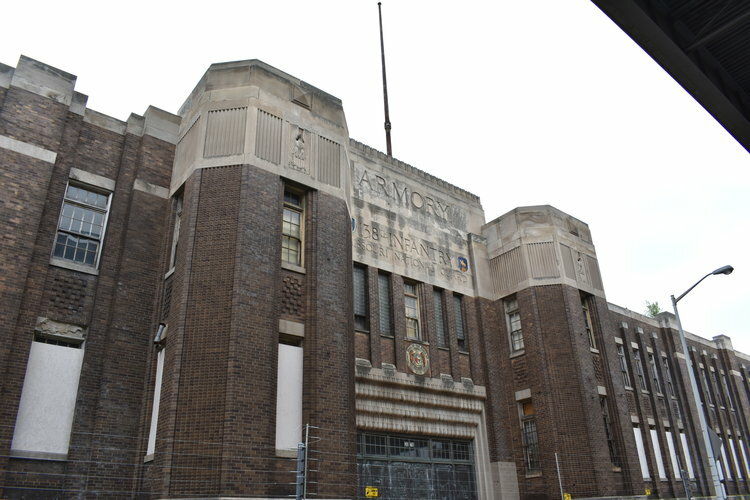 Well in total the Armory ($47.1M investment) and a plan for three separate buildings just to the east of the Armory total and invenstment of $83.4M. That is a massive amount of money to be spent and should be cause for celebration. The new building will centered around a three-story office facility with floating conference rooms built into the original atrium, offering stunning views of the historic, 90-foot high interior space. Other highlights include a rooftop green space, a spa and wellness center, and nearly 200 parking spaces on the building’s basement level. Hopefully the new tenant is from outside St. Louis and not just a musical chairs where one part of the city gains at the expense of another. If it's from the county, it would be a win, if it's from outside the region, even better. ...future plans are in the works for a 90,500-square-foot building located directly across the street (500 Prospect Ave.) that would include a microbrewery, a 135-room hotel, and a park garage on Grand Ave. with capacity for 300 cars. So, a high-visibility historic building is coming back and finding new life. And if we devote resources to connecting these rail yard, light industrial and isolated parts of the city to the residential areas, we have hope. Thank you! When we make updates and post new stories, you'll be the first to know!